1On the Customer Center screen, select your customer. 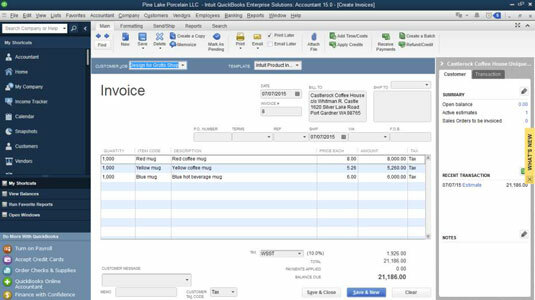 QuickBooks shows you a list of transactions for the customer, including any active estimates. 2Double-click the estimate you want to work with. The Create Estimates window opens. 3Click the Create Invoice button at the top of the window. If you indicated that you might progress-bill a customer or client, QuickBooks displays a dialog box that asks whether you want to invoice the entire estimate or just some portion of the estimate. Answer the question by marking the appropriate option button. 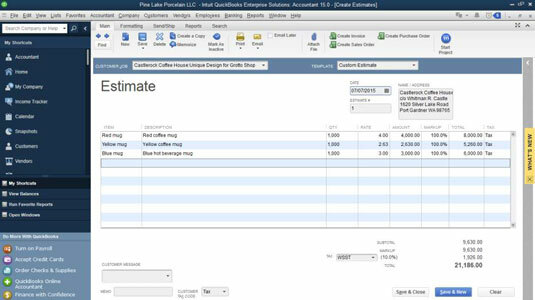 Then click OK. QuickBooks creates an invoice based on your estimate. If you need to make any changes, you edit the invoice directly and then click OK. If you don’t see the Create button at the top of your Create Estimates window, maximize the window’s size so it fills the QuickBooks program window. Increasing the window size should solve the problem. By the way, you can also click the arrow at the right edge of the Create button to display the things you can create: invoices, sales orders, purchase orders, and letters. 4Make any necessary changes to the resulting invoice. The invoice that you see is a regular QuickBooks invoice, and you can edit it the same way that you edit any invoice. Until you click Save & New, the invoice isn’t recorded in your records. 5After you make all your changes, click Save & New or Save & Close to record the invoice. If you want to print the invoice instead, you can click the Print button.